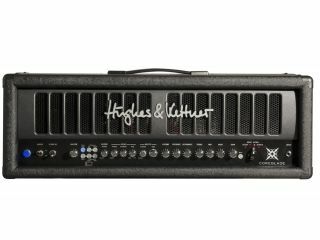 Hughes & Kettner has unveiled the Coreblade, a programmable 100w valve guitar head that assumes the flagship position amongst the German brand's high-end guitar amp range. Created to deliver massive flexibility and oriented towards players needing world-class high gain sounds, the Coreblade offers huge controllability and a staggering features list while remaining easy to use. At the heart of the Coreblade is a four channel preamp design; two of these are voiced for completely different high gain tones and are partnered by a wide-ranging Drive channel and high headroom Clean channel. Three parallel effects modules allow access to reverb, delay, chorus, flanger, phaser and tremolo, each of which can be mixed with the dry guitar signal via the Coreblade's Inversed Parallel Modulation circuit. The architecture of the amplifier is such that the guitar signal remains in the analogue domain from input to output, preserving tone all the way. In addition, the 100w power amp features a feedback circuit that reconfigures depending on preamp channel in operation, essentially changing character to suit the dialled 'front end' tone. Having created their perfect sounds, users can store up to 128 tones on-board for recall at the press of a switch; built-in MIDI capability further extends the Coreblade's versatility and ease of use on stage in particular. The Hughes&Kettner Coreblade retails for £1999 in the UK.